I’m horrible about this. As often as I put pen to paper for thank you notes and invitations, I can never get my act together to send a Christmas Card. I don’t like most cards, in general. Somehow my friends always find perfect examples of the genre. And not one of them comes from a Hallmark. Recently, we’ve had a spate of family portrait style cards — only with snapshots of the kids without parents. I love them. Kids really shift your view of the holidays. My grandmother (and Mom, this year) makes a point of sending a card from Bethlehem, MD, with the Three Kings postmark that they use there. How unusual and thoughtful is that? Our friends display the hundreds of cards that they get by hanging them on a string or ribbon threaded up the bannister. The cards become festive decoration — glittery cardboard swag — during the holidays. I’ve seen doorways and mirrors framed by Christmas cards, too. This year, I’m going to try and send at least one… something. Call it a “Christmas greeting” to someone to whom I owe more than an email or phone call. Maybe I’ll cut a snowflake out of construction paper like I did when I was a kid. A unique card… no two are alike! But a personally penned message of warmth and love can’t be all bad. Warmth and love. Isn’t that a big part of the holiday season? This entry was posted in Elegantology and tagged Christmas, decorating, Elegantology, Living, traditions. Bookmark the permalink. 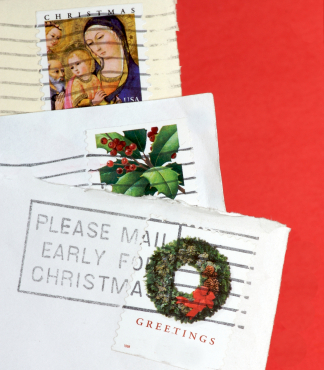 Here’s to warmth and love and handwritten Christmas cards! I do hope you send at least one–someone will be so happy to hear from you! Thanks for stopping by my blog and your welcome message is great–I’m all for bringing a little elegance back. At least one it is! Thanks for your note of encouragement, and for visiting. After reading your blog and a couple of other new favourites, I know I’ve got a long way to go before I get to your level of sophistication. I have a debate every year with the husband…do we send a card with just the children or with the whole family? I usually prefer pictures of the whole family, but as my friends age (getting into the late 30s), more and more cards just picture the children. I must admit, I rush to the mailbox in December in anticipation of the Christmas cards. It is truly the least expensive way to stay in touch with the friends from all phases of your life. TTI – as older parents (40’s), I think that our kids are far cuter and more card worthy. Maybe they will be the deciding factor to kick me into card sending mode.